Recycle oil waste more cost-efficiently with EZ-DMULSE, a highly effective multi-purpose low-high temperature demulsifier that removes water from slop oil, lube oil, crankcase oil and bunker oil waste quickly and easily. Trusted by industry leaders and formulated using only environmentally acceptable chemicals, it reclaims more oil for recycling while adhering to all industry regulations. Perfect for bunker and waste oil treatment, EZ-DMULSE is specially formulated to work at lower temperatures, successfully separating water from lube, crankcase and slop oil so that they can be re-used as recycled bunker fuel oil. If you’d like to learn more about EZ-DMULSE, you can download a copy of our latest sell sheet. 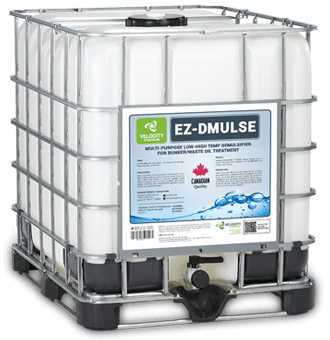 EZ-DMULSE’s carefully engineered formula separates water from waste bunker and lube oil in less than 24-hours, cutting maintenance time and costs. Because EZ-DMULSE removes more water at lower temperatures, the recycled oil is a higher quality and is ready to use immediately. Comprising only environmentally acceptable chemicals, the demulsifying process satisfies the strictest industry regulations – even when used at lower temperatures. EZ-DMULSE is now available directly from Velocity Chemicals, with orders shipped to anywhere in BC within 24 hours. To order, call one of our specialists today at toll-free 1-888-963-9499.